Most people know that Flush is the title of Virginia Woolf’s biography of Elizabeth Barrett Browning’s spaniel. Here are five things, however, you might not have known about this delightful book. 1. Woolf starting writing Flush after finishing her long novel The Years. In a letter to Lady Ottoline Morrell, she writes: ‘I was so tired after the Waves, that I lay in the garden and read the Browning love letters, and the figure of their dog made me laugh so I couldn’t resist making him a Life’. 3. Virginia Woolf often referred to herself by animal names. She called herself ‘Billy’, ‘Goat’ or ‘Ape’ in her correspondence to her sister and brother, and signed a thank-you letter to a favourable reviewer of Flush with ‘Yours affectionate old English springer spaniel Virginia’. 4. The model for Flush was the puppy Pinker. The dog was given to the Woolfs in 1926 by Virginia’s friend and lover Vita Sackville-West. 5. Although Flush is nowadays often seen and discussed as hardly more than a humorous writer’s holiday, the work does raise questions about human relations with animals. In her obituary ‘On a faithful friend’, Woolf writes in 1904 that ‘There is something, too, profane in the familiarity, half contemptuous, with which we treat our animals. We deliberately transplant a little bit of simple wild life, and make it grow up beside ours, which is neither simple nor wild’. * Susan Squier, Virginia Woolf and London: The Sexual Politics of the City. Chapel Hill, NC: University of North Carolina Press, 1985 (p. 127). Viola van de Sandt is a postgraduate student in English literature at King’s College, London. She loves writing about women in English and American novels, and does exactly that on her own blog, ‘Broken Glass’. 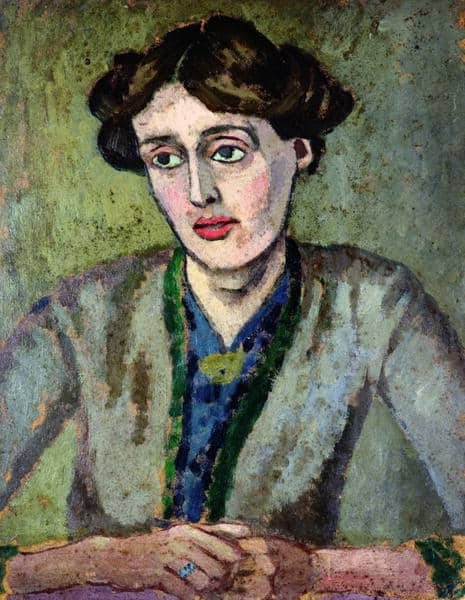 Image: Portrait of Virginia Woolf, c. 1917, public domain. #3 is definitely interesting. No wolf references though, eh? ;) On a serious note though, I wonder what were the reasons behind the animals she did refer herself to. Fascinating indeed. I am yet to read any Virginia Woolf and must confess to not knowing much about her, other than that she was part of the Bloomsbury set and met her demise after walking into the River Ouse near her house in Sussex. Woolf’s observations about how us humans treat our pets is a very valid one. Same with me here! I just need to psyche myself up before embarking on a woolf novel! An interesting post from one of my most favorite blogs, Interesting Literature. This one offers five fascinating facts about Virginia Woolf’s life of a dog, Flush. Hi I have nominated you for the One Lovely Blog Award. Because you have an interesting style of blogging and your topics look like they are about historical topics, with a mix. Enlightening and entertaining read. Thanks for sharing!